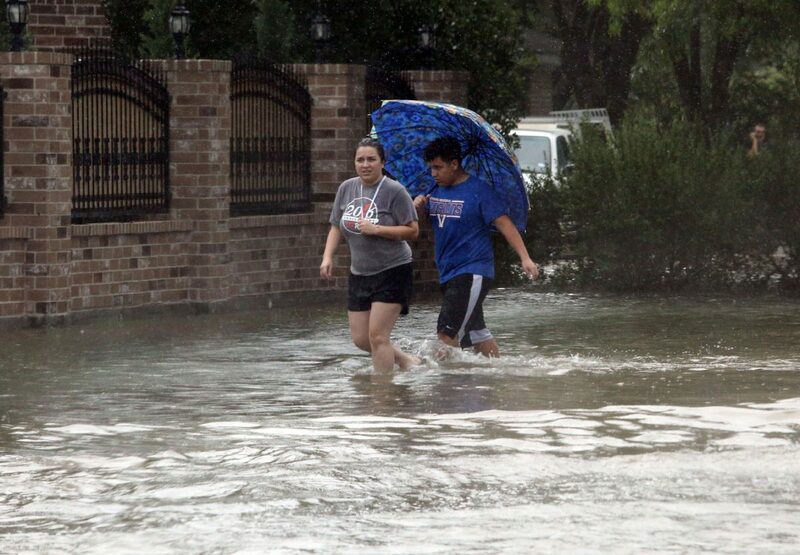 Pedestrians wade through high water after heavy rains caused water to rise and flood whole neighborhoods on Thursday, June 21, 2018, in Mission. Affordable Homes of South Texas Inc. is offering home repair grants of up to $300 to homeowners in certain areas affected by the recent flooding, according to a press release from the organization. As of Friday, residents of McAllen and Pharr can visit the AHSTI office to apply for a grant. Residents of the Mid-Valley — Weslaco, Mercedes, Donna, Progreso and the Delta area — may call to join the waiting list, which as of that day consisted of 200 people. “The grant is just enough to tide over until any insurance claimed comes through, or if you’ve applied for FEMA,” said Myra Martinez, deputy executive director of operations at AHSTI. People applying for the grants do not need to have insurance or apply for FEMA. However, the money must be used for home repairs only. Funds were initially allocated to the Mid-Valley due to the flooding in that area Wednesday and Thursday, but were exhausted in one day due to demand. Much of the funding has come from local governments that provide the money for their residents. The cities of McAllen and Pharr are the latest to fund the program, so only residents from those cities can receive that money. AHSTI is working to get funds for the Mid-Valley and Mission. The number of grants available and the time in which they are given depends on how quickly and how much is donated by individuals, businesses and local governments. Businesses and individuals can donate to the grant program on the AHSTI website, and whatever money is received from these private donations will be given to those in need regardless of location. There is no maximum amount. AHSTI gives grants to local homeowners in need of fixing their house year-round, and the average cost of repairs is $300 to $400. In times of emergency, such as natural disasters, the grant amount stays the same but goes toward relief efforts. Applicants must be a homeowner and provide the following items: a state ID, license or other form of identification; proof of income, such as a check stub or bank statement showing direct deposit; printed pictures of what needs to be repaired; and an estimated cost of repairs or supplies. To apply for a grant, visit the McAllen office at 500 S. 15 St. or call at (956) 687-6263. Residents may also visit the office at 134 W. Fifth St., or call (956) 447-8909. Anyone unable to leave their home may call or send a message to set up an online application. Documents may be submitted online via a Facebook message or an email to info@ahsti.org. Businesses and individuals wanting to donate may call the McAllen office or email Myra Martinez at mmartinez@ahsti.org.